There are some pretty amazing airfares available from Kelowna that allow you to visit both Hong Kong AND Shanghai, China for just $731 CAD roundtrip including taxes. $731 roundtrip to either destination on it's own would be an amazing price. The flights involve using a combination of Air Canada and Cathay Pacific or China Eastern Airlines. 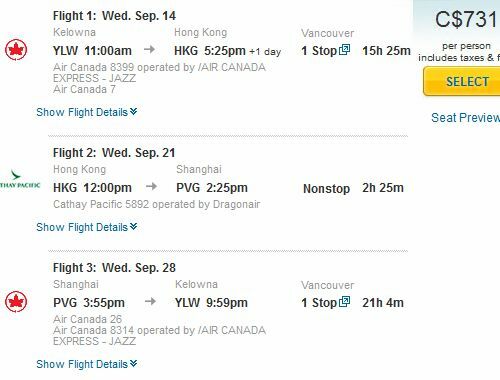 Kelowna to Hong Kong | $754 roundtrip including taxes | cheapest ever! kelowna, YLW, flight deals, air canada, hong kong, hkg, asia, east asia, china, shanghai, pvg, cathay pacific or china eastern airlines.